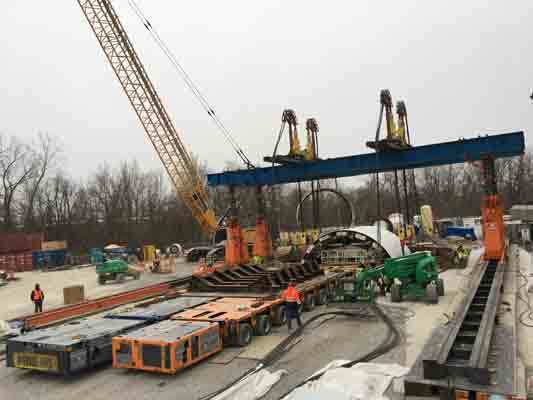 PSC Crane & Rigging, headquartered in Piqua, Ohio, supplied a Hydra-Slide HT500 heavy track hydraulic skidding system and four newly acquired JS250 jacking load shoes to setup and assemble a 27-ft. diameter boring machine at the Dugway Storage Tunnel in Cleveland, Ohio. 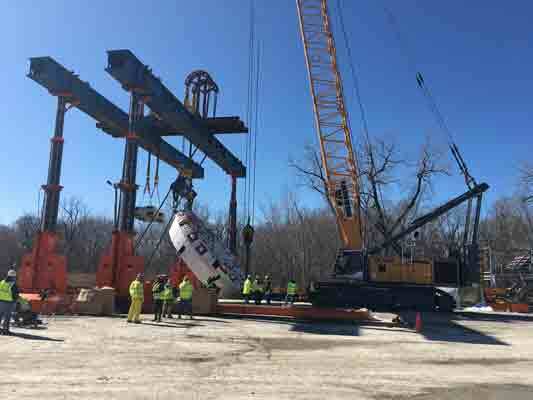 The 496-ton main shield was lowered first. The equipment was integral to delivery of a heavy lift and transport contract for a crucial phase of the $150+ million project, part of a broader plan for the collection, storage and treatment of waste and rain waters, with the objective of reducing the level of environmental pollution in Lake Erie, one of the five Great Lakes in North America. The project is overseen by a joint venture formed by Lane Construction Corporation’s subsidiary, S.A. Healy, and Lane’s parent, Salini Impregilo. 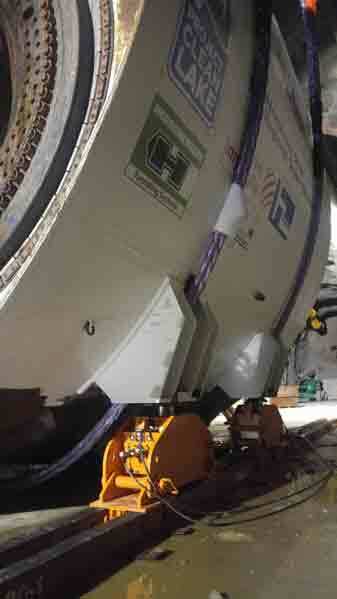 PSC Crane & Rigging lowered six of the tunnel boring machine’s 12 parts. 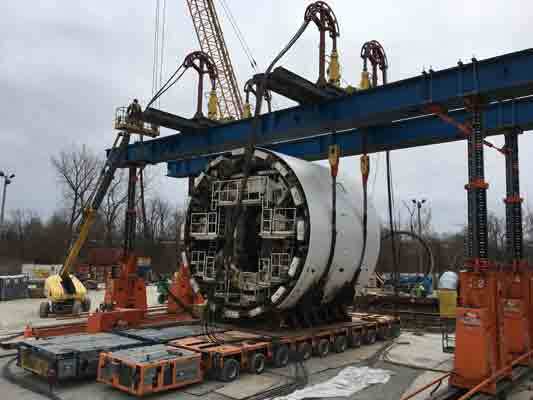 PSC accepted a scope of work to load the over dimensional, overweight tunnel boring machine components, transport them to an installation shaft, lower six of 12 pieces (the largest weighing nearly 500 tons), and assist with assembly 200 ft. beneath the surface. The other six, smaller parts were lowered by crawler crane with the piecemeal descent taking place in sequence. PSC was then presented with a challenge to slide the reassembled boring machine approx. 300 ft.
Four “Up ’N Go” load shoes (orange) and the HT500 await the main shield as it is lowered down the shaft. PSC loaded the components onto 20 lines of self-propelled modular transporter (SPMT) before moving them half a mile to the shaft. There, a 700-ton capacity hydraulic gantry served as a lift tower in conjunction with an 800 metric ton capacity Enerpac strand jack atop 80-ft. girder beams spanning the 50-ft. diameter, 200-ft. deep shaft. Once on the shaft floor below, the HT500 combined with 250-ton capacity JS250 "Up ’N Go" skid shoes to slide the boring machine approx. 300 ft.
A crawler crane combined with the hydraulic gantry and strand jack to prepare items for lowering. Once on the shaft floor below, the HT500, which can be used to move almost all types of heavy loads, combined with Hydra-Slide’s 250-ton capacity JS250 "Up ’N Go" load shoes that are engineered as an add-on to the standard HT500 track. The shoes can be connected hydraulically with any number of other units, increasing the system capacity to multiples of 1,000 ton while maintaining equal load support and weight distribution between all points. The skidding system and load shoes were operated with a Hydra-Pac synchronous diesel pump, also supplied by Hydra-Slide. A 700-ton capacity hydraulic gantry served as a lift tower in conjunction with an 800 metric ton capacity Enerpac strand jack. Hydra-Slide’s 250-ton capacity JS250 "Up ’N Go" load shoes. The S.A. Healy-Salini Impregilo signed a contract to build the Dugway Storage Tunnel, which is 4.5km-long, with a diameter of 8m. To that end, the boring machine is already in full operation with tunneling well underway. The project is scheduled for completion in Q1 or Q2 2018.